351 Commonwealth is located on the north side of Commonwealth, between Hereford and Massachusetts Avenue, with 349 Commonwealth to the east and 353 Commonwealth to the west. 351 Commonwealth was designed by architect G. Wilton Lewis and built in 1894-1895, one of three contiguous houses (349-351-353 Commonwealth) built and owned by carpenter and building contractor Luther Moore Merrill for speculative sale. He is shown as the owner on the original building permit application dated April 23, 1894, and on the final building inspection report dated March 8, 1895. The three houses are designed as a single unit centered on a palladian window. Luther Merrill purchased the land for 349-351-353 Commonwealth on March 15, 1894, from Mortimer Blake Mason. He and his wife, Mary Emma (Phillips) Mason, lived at 347 Commonwealth, and in the deed to Luther Merrill he included language specifying that any buildings built on the land before February of 1899 could only be used for “first class private residences” and the depth of any such buildings could be no greater than the depth of his house at 347 Commonwealth. 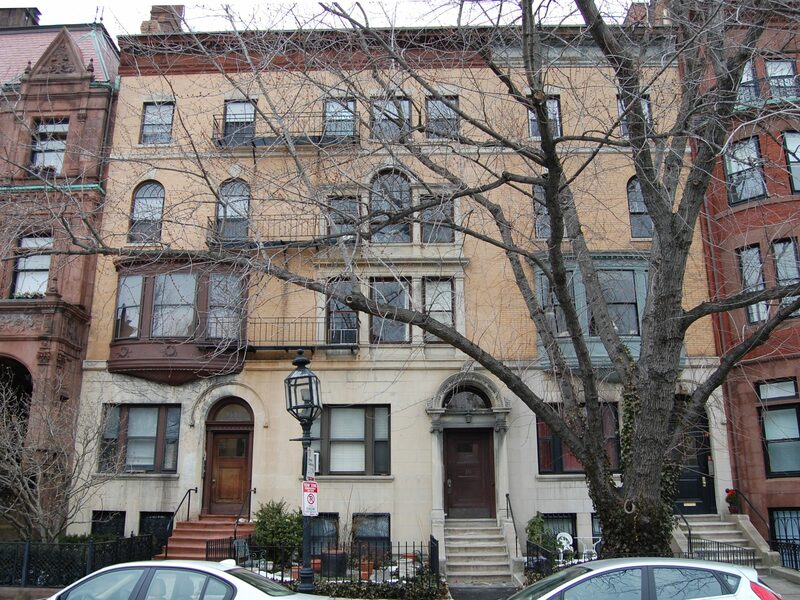 The 60 foot wide lot at 349-351-353 Commonwealth had been part of a 131 foot lot extending to Massachusetts Avenue previously owned by Benjamin Williams Crowninshield. He had sold the western 70 feet in February of 1880 to Oliver Ames, who built his home on it at 355 Commonwealth, and the eastern 1 foot (along with an additional 30 foot lot he acquired the same day) in July of 1888 to Mortimer Mason. Benjamin Crowninshield had purchased the 131 foot lot on January 9, 1880, from Grenville T. W. Braman, Henry D. Hyde, and Henry M. Whitney, trustees of a real estate investment trust. It was part of a parcel the trust had purchased on March 1, 1872, from the Boston Water Power Company, one of several parcels the trust had purchased at the same time. The land owned by the trust originally had been divided by Parker Street, a 60 foot wide street located on top of the Cross Dam, which ran southwest from Beacon at approximately a 45 degree angle, intersecting the north side of Commonwealth at a point about 549 feet west of Hereford. When the street was abandoned as a public thoroughfare in 1879, Grenville Braman and his partners purchased the land underneath from the Boston Water Power Company and combined it with their other property. 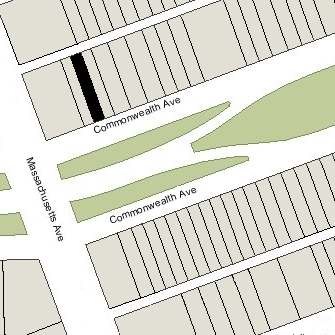 The houses at 345-347-349-351-353-355 Commonwealth were partially built on land that previously had been Parker Street, with the Cross Dam below. Click here for an index to the deeds for 351 Commonwealth, and click here for further information on the land on the north side of Commonwealth between Hereford and Massachusetts Avenue. Luther Merrill was the son of Silas Whiton Merrill and Eliza Belcher (Crabtree) Merrill. His father, also a carpenter and house contractor, had died in April of 1890, intestate. Eliza Merrill had died in October of 1882, and Silas Merrill’s heirs at law were his three surviving children: Mary C. (Merrill) Munsell, the wife of Harvey M. Munsell, Luther Merrill, and Fanny W. Merrill. On May 15, 1890, they established a trust under which Luther Merrill would administer the assets they inherited from their father. He purchased the land for 349-351-353 Commonwealth in his capacity as trustee. On March 7, 1895, 351 Commonwealth was purchased from Luther Merrill by Caroline Abigail (Brewer) Croft, trustee under the will of Gardner Brewer for the benefit of Gardner Brewer’s granddaughter, Caroline Brewer (Amory) Lyman, the wife of George Hinckley Lyman, Jr. Caroline Croft was Caroline Lyman’s maternal aunt; she was the wife of Arthur Croft, an artist. Gardner and Caroline Lyman made 351 Commonwealth their home. They previously had lived at 279 Clarendon . They also maintained a home in Beverly Farms. George Lyman was an attorney and served as federal Collector of Customs for the Port of Boston from 1898 to 1910. 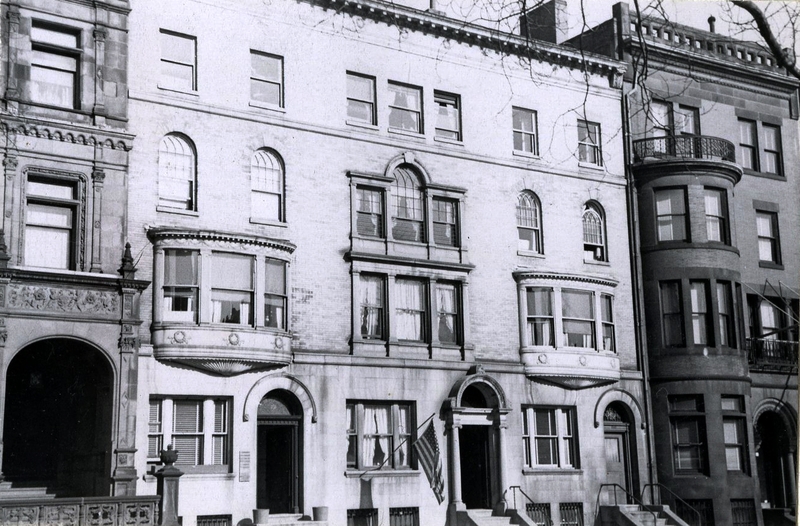 In April of 1901, then Vice-President Theodore Roosevelt visited Boston and stayed at 351 Commonwealth with the Lymans. The Lymans raised their three children at 351 Commonwealth: Ellen Brewer Lyman, Minna Cornelia Lyman, and George Hinckley Lyman, III. Ellen Lyman married in November of 1903 to Charles Taylor Lovering, Jr., a stockbroker. Prior to their marriage, he had lived at 263 Commonwealth with his parents, Charles Taylor Lovering and Marian Shaw (Sears) Lovering, After their marriage, they lived at 845 Boylston, later in an apartment at 371 Commonwealth, and then at 9 Gloucester. Minna Cornelia Lyman married in January of 1914 to Walter Hunnewell, Jr., a banker. Prior to their marriage, he had lived at 261 Commonwealth with his father, Walter Hunnewell, Sr., a widower. After their marriage, they lived at 173 Beacon and in Wellesley. George H. Lyman, III, a stockbroker, married in November of 1921 to Eleanor Lee Higginson. Prior to their marriage, she had lived at 274 Beacon with her parents, Francis Lee Higginson and Corina Anna (Shattuck) Higginson. After their marriage, they lived in an apartment at the Hotel Agassiz at 191 Commonwealth and then at 249 Marlborough. George Lyman died in May of 1945. 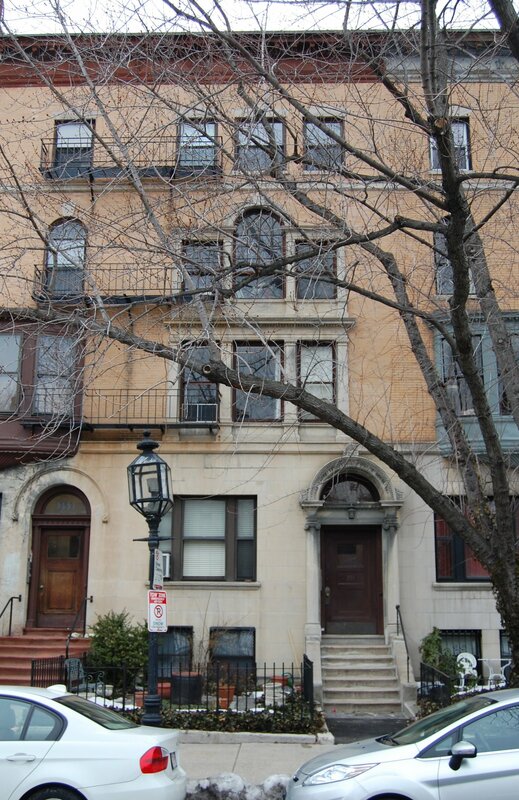 Caroline Lyman continued to live at 351 Commonwealth until her death in 1955. On May 31, 1955, 351 Commonwealth was purchased from George Lyman, III, and Walter Hunnewell, Jr., successor trustees of the trust established by Gardner Brewer’s will, by the National Realty Company (Charles Talanian, president; Thomas J. Diab, treasurer). On September 4, 1956, 351 Commonwealth was purchased from National Realty by Dr. Eugene Y. Chen, a dentist, and his wife, Helen Chen. They lived in Somerville. On October 24, 1978, 351 Commonwealth was purchased from the Chens by Kevin O’Reilly, trustee of the 357 Mozart Trust, and on December 31, 1980, it was purchased from the 357 Mozart Trust by the Eastmare Corporation. Kevin O’Reilly was the treasurer of Eastmare Corporation. On January 28, 1981, the Eastemare Corporation converted the property into ten condominium units, the 351 Commonwealth Condominium.